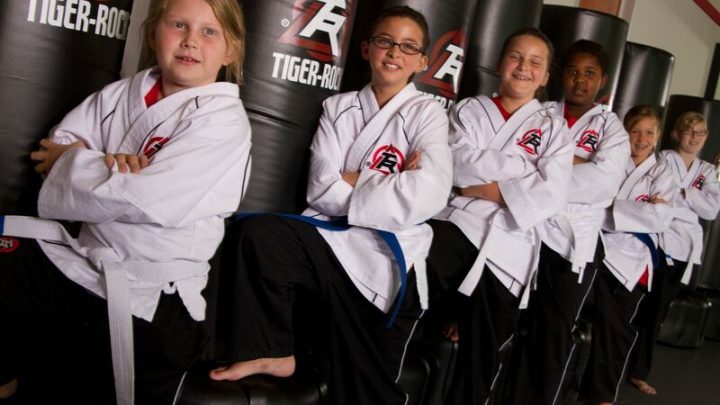 Your child will build self-confidence, respect, and self-discipline when taking Tiger-Rock’s kids martial arts classes. We teach constructive lessons that are a great way to keep kids active and healthy. The skills that they learn at the academy will be beneficial to them not only on the mat, but most importantly, in life. We developed an age-based curriculum for our kids martial arts and teen martial arts students ages 4 to 15 years old. Read more about our kids martial arts programs for Katy TX, and contact us to schedule your child’s first lesson! At our Tiger-Rock Martial Arts academies in Katy TX, we offer three wonderful programs for pre-school, elementary and middle school, and high school students. The Tiger-Cubs Program serves as early childhood development program at Tiger-Rock. Designed for 4 and 5-year-olds, students in this program learn symmetrical movements as well as introductory kicking and striking drills. Click here to learn more! The Juniors Program is for elementary and middle school students ages 6 to 11. In addition to kicking, striking, and other technical drills, students in this program learn important anti-bullying techniques and real world self-defense. Click here to learn more! The Teen Program is designed for students ages 12 to 15. This is a well-rounded martial arts program that includes martial arts, self-defense, and leadership training as we aim to prepare tomorrow’s leaders today. Click here to learn more! Martial arts is an incredible activity for young kids, adolescents, and teenagers. In fact, training in the martial arts can help improve physical fitness and encourage mental and social wellness. In addition, self-defense is a major focus of our kids martial arts training at Tiger-Rock. Our self-defense lessons are more than just learning martial arts techniques; it also encompasses learning important real-world life skills to avoid danger. Anti-bullying education is a cornerstone of our program(s). Most importantly, Tiger-Rock Martial Arts in Katy teaches honor, courtesy, and respect—part of our key tenets of taekwondo. We encourage our Tiger-Rock students to practice respect for parents, teachers, peers, and themselves at all times. Click here to visit one of our locations today!